Pattern: GOLDEN WHEAT by KNOWLES, EDWIN Pattern #: 817E4 Description: YORKTOWNE,YELLOW WHEAT,NO TRIM....Gold trim on the inside of the rim.. Manufacturer Status: Discontinued Circa: 1939.......... Dessert/Fruit Bowl 6" in diameter and about 1" high.. mark on the back boat.. all have a chip on the rim.. buying as is condition..
PRICE: $3.25 plus $1.50 special handling charge. Pattern: GOLDEN WHEAT by HOMER LAUGHLIN CO Description: ALL YELLOW WHEAT IN CENTER, 22K GOLD TRIM..some with mark other without. Pattern: GOLDEN WHEAT by HOMER LAUGHLIN CO Description: ALL YELLOW WHEAT IN CENTER, 22K GOLD trim. 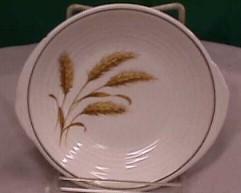 Pattern: GOLDEN WHEAT by HOMER LAUGHLIN CO Description: ALL YELLOW WHEAT IN CENTER, 22K GOLD trim....4. Pattern: GOLDEN WHEAT by HOMER LAUGHLIN CO Description: ALL YELLOW WHEAT IN CENTER, 22K GOLD..some with mark others without the mark..
Pattern: GOLDEN WHEAT by HOMER LAUGHLIN CO Description: ALL YELLOW WHEAT IN CENTER, 22K GOLD. Pattern: GOLDEN WHEAT by HOMER LAUGHLIN CO Description: ALL YELLOW WHEAT IN CENTER, 22K GOLD TRIM..
Pattern: GOLDEN WHEAT by HOMER LAUGHLIN CO Description: ALL YELLOW WHEAT IN CENTER, 22K GOLD..some have marks and others don't.